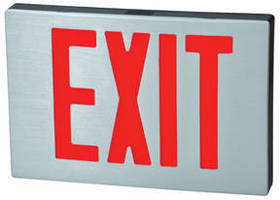 Fulham now offers a series of three new types of cUL listed FireHorse brand Exit and Emergency Lighting Products. o LED die-cast aluminum exit signs couple rich, unparalleled aesthetics with all-metal construction; premium performance and simplified installation make them the benchmark selection for both architectural and commercial applications. o Combo units are energy-saving LED exit signs and emergency lighting offering contemporary design, flexibility and multi-functional capabilities. o Low-profile emergency lighting units with fully adjustable heads are contemporary, quick-installing and economical. These "powered" exit and emergency products available in many colors round out Fulham's new FREELITE brand self-illuminating, photoluminescent exit signage which requires no additional power for operation other than ambient light it absorbs when the lights are on. For more information about Fulham Exit and Emergency products, please contact Rob at radams@fulham.com. Fulham Co., Inc. is a leading global supplier of electronic ballasts, lamps, electronic transformers, LED arrays & drivers, emergency lighting, induction systems, wiring harnesses and custom assemblies. Fulham has facilities dedicated to sales and service excellence in North America, the Middle East, Europe, Asia, Africa, India, and Latin America. Fulham's product diversity and excellence is due in part to its international staff of world-class engineers and production experts, as well as its investment and commitment to leadership in product innovation. Fulham's product quality ranks among the best in the industry. Fulham is dedicated to being the leader in cost-effective and energy-efficient lighting solutions. For more information about Fulham Co., Inc., please visit www.fulham.com, or contact our Sales Services team at 1.323.599.5000.